I was always against plain yogurt. Gross. I tried everything to sweeten it from honey to sugar free Torani syrups to stevia drops. I never liked it. Then I started adding a teaspoon of homemade jam to it and then I actually started liking it. Now I’m at the point where I can just eat it plain and eat a lot of it. At Costco I think I pay about $5.99 for a quart of Fage Greek yogurt and I easily eat it within the week. My mom has always bugged me about making my own but it’s always scared me. I’ve randomly googled how to make it in a crockpot since I “overheard” on facebook that you could make it that way but I was still to scared. Once I realized that even if it was a flop, I only wasted about $2, I decided to take the plunge and I’m glad I did! I’ve made it twice now, the first time was a total failure but I figured out what my mistake was and the second time was a total success. I’ll share both things with you so hopefully you can get it right the first time! So on clearance I found a half gallon of organic milk for $2.99 and 1 cup of organic plain yogurt for $0.49. 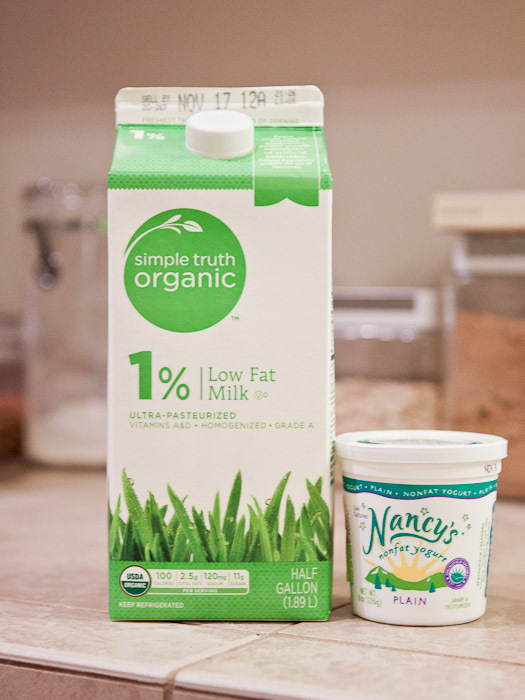 This will make a half gallon of organic yogurt for $3.48 compared to $3.99 for a quart of organic (so x2 would be $7.98 for a half gallon for a savings of $4.50). 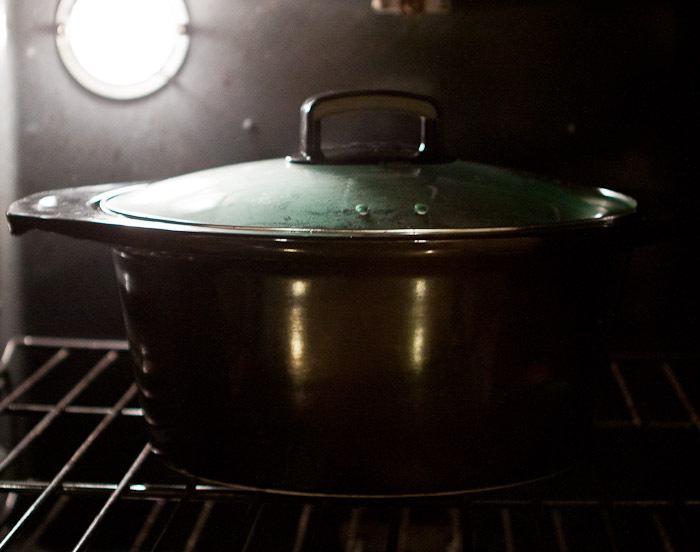 First, get out your crock pot and turn it on low and put the lid on so the stone can warm up. 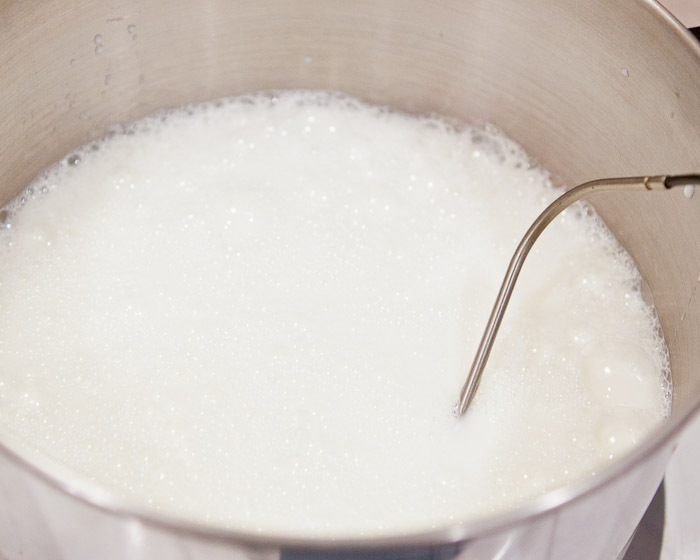 It takes about 30 minutes but it will also take about 30 minutes for the milk to be ready to put in it. Next, pour however much milk you want to make into yogurt into a saucepan and warm it on medium (stirring frequently so it doesn’t burn) until the temperature reaches 185 degrees F. I just used a digital meat thermometer but word on the street is that you can get candy thermometers for less than $10. 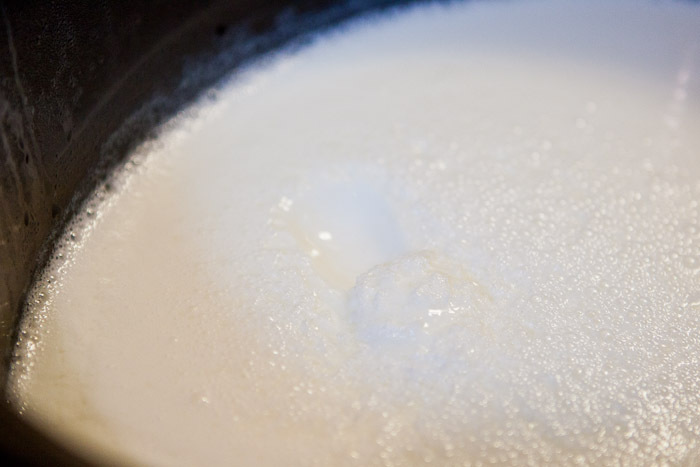 While the milk is warming on the stove, take 1/4 cup of already made yogurt per every quart of milk you are making into yogurt and put it in a medium bowl. It’s best to let this warm up a bit so it doesn’t cool the milk down in the second to last step. So I’m making a half gallon so I used 1/2 cup of yogurt for the 1/2 gallon (2 quarts) of milk. 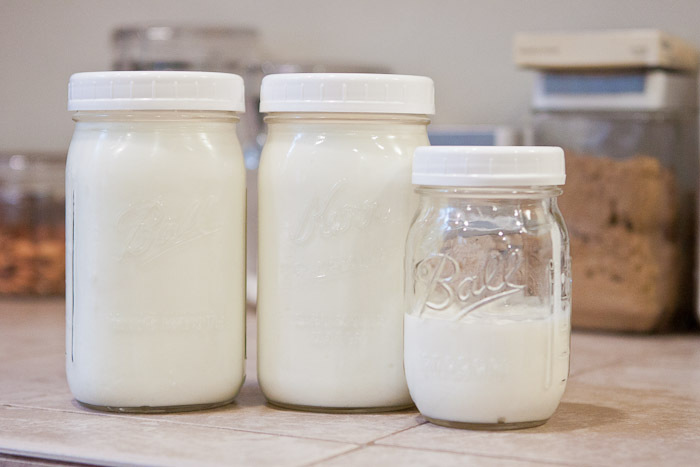 Tip: After this batch is done and you are putting it into containers, save however much yogurt you need for the next batch from the batch you just made. 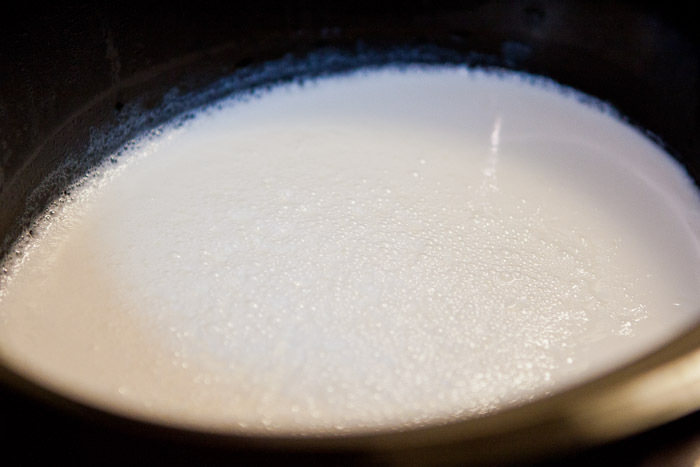 Once the milk in the pan reaches 185 degrees F, turn the stove off, remove pot from burner, cover and place the pot in a few inches of cool water (I just fill my sink up a little). This is where I screwed up the first time. Let the milk cool from 185 degrees down to 115 degrees. First time I let it cool down to 90 because I wasn’t paying attention and the blog I was following said between 90-110 and it would take about 10 minutes. Well after about 5 minutes it cooled way down. The second time I only let it cool to 115 and my yogurt came out perfectly. 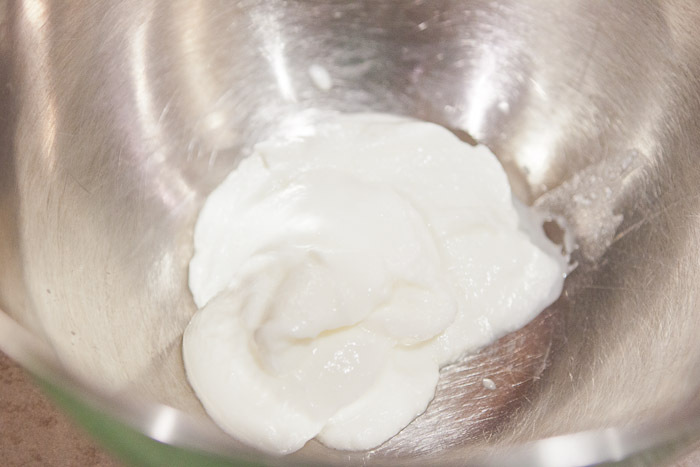 After yogurt has cooled to 115, take 1 cup of the warm milk and whisk it with the yogurt in the medium bowl. Take the rest of the milk and pour it into your crockpot. Immediately turn off and unplug your crock pot and remove the stone. Then add the milk and yogurt mixture to the rest of the milk in the crockpot. Whisk together briefly. 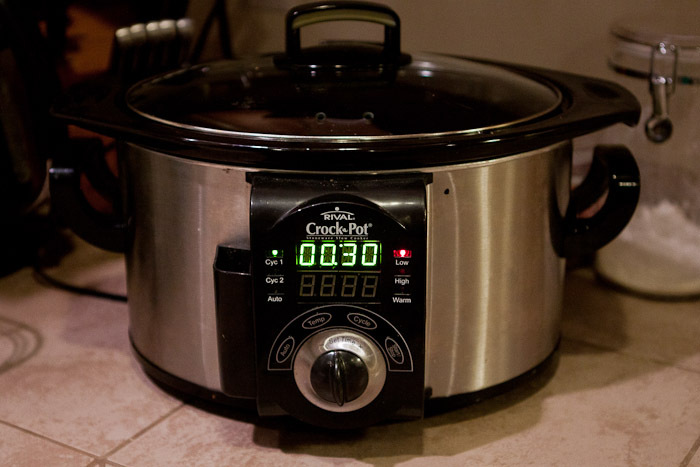 Now there are two options of what to do with your crockpot for the next 8-12 hours. I do this at night so it’s ready in the morning. Some just wrap the crockpot in a heavy towel or blanket to keep warm (did this the first time and it wasn’t very warm in the morning) or you can put your crockpot in a TURNED OFF oven with the oven light on. I chose to do that the second time. Shut the door and leave the light on all night. It needs to be about 70 degrees in your house for this to really stay warm, if it’s colder than that (like our house now), leave it in the oven. I then put the whole crockpot in the fridge to cool and to thicken more (which is thickened up a little bit more after cooling). I’ll eat the two quarts within the week with pumpkin spice granola (recipe to come) and then the little pint is enough to start my next batch! Perfect! Saved $4.50 a week so that’s $18 a month and on top of that I now have organic yogurt! Note added: If you want it real thick, like Greek yogurt, you need to strain it as it sits in the fridge. So take some cheesecloth, coffee filters or a paper towel and line a mesh strainer and dump the yogurt into the strainer and put something like a large bowl under it so the liquid (the whey) can drip down. You can either discard the whey or you can drink it or add it to smoothies since it’s good for your digestive system.